Information documents received by Ban Michigan Fracking on March 1 and 18 show Encana Oil and Gas USA is poised to establish a new national record for water usage on a horizontal frack pad, surpassing the record it set just last fall in Kalkaska County. But at a videotaped March 5 webinar of the University of Michigan’s ongoing governor-approved fracking study, panelists showed little concern. BMF has provided the underlying documents for viewing at Respect My Planet. 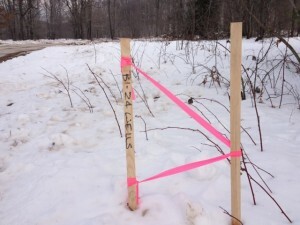 This page reported on February 5 that last year Encana horizontally fracked three gas wells with a total of 42 million gallons of water on a pad in the Au Sable State Forest. One of them used 21 million gallons. The pad is on Sunset Trail, south of M-72, between the cities of Kalkaska and Grayling. The article cited a little-noticed page at the website of FracFocus, the industry-applauded online database. The water quantity was so large that BMF corresponded with FracFocus before publishing, to make sure it wasn’t a clerical error. Industry groups and government, including the Michigan Department of Environmental Quality, have long been saying a typical frack well uses 5 million gallons, a quarter of the amount Encana used at the pad. The new numbers may have set a national water-usage record, we suggested in our post. Seven weeks have passed. No one has told us of a US well using more water. We take it as confirmed that Michigan is the home of the most water-intensive frack well in the United States. This means it is also the largest frack waste producer in the United States. A frack well pad is a several-acre cleared industrial site, accommodating intense work with big machinery, impoundments, trucks, tanks, trailers, water, chemicals, sandpiles, 24-hour lighting, pipelines, roads, and emergency equipment. Even bigger wells on frack pads producing even more waste are now on the horizon. Michigan's Au Sable Forest is the site of Encana's proposed record-setting frack wells. Photo by Paul Brady. Encana applied for another new permit in February, for a well named “State Excelsior 5-12 HD1″. This well will be on a pad with two others, north of M-72 on Sunset Trail, also in the state forest. We again requested documents. 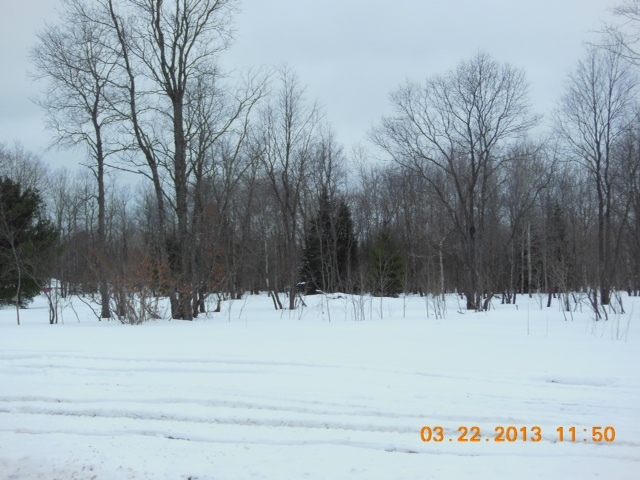 A site where Encana proposes a record-setting well in Kalkaska County, Michigan. Photo by Paul Brady. Undeterred, Encana included a water withdrawal proposal with the application. One proposal covered all three wells, with water taken from an aquifer 151 feet down. The quantity would be 550,000 barrels for each, or 1,650,000 barrels for all three. At 42 gallons a barrel, this means 23,100,000 gallons per well, and 69,300,000 gallons for the whole pad. Withdrawal would occur over a 30-day period. Not only would the pad set a second national record. So would each of the individual wells. We wrote the MDEQ asking when it would do the required site-specific review for water. We also asked when a state official would inspect the site to assess rare species and unique natural features. We also asked whether the permit decision would consider the cumulative impact on rare species, and invasive species, of the projects Encana is planning in the immediate area. We also asked about the cumulative impact due to the 500 to 1700 wells Encana recently told investors it is planning in the northern lower peninsula. MDEQ responded on March 11, refusing to answer “at this time.” The MDEQ does have a rule that certain well data is to be held confidential for a period at Encana’s request, but the rule does not kick in at this stage. Meanwhile on March 18 BMF received new documents about applications for five new Encana wells on the other pad, the 42-million-gallon site south of M-72. According to the applications, two of the applied-for wells would use 18.9 million gallons each. Three would use 31.5 million gallons each, for the third time in a year setting national records. The total water usage of the five wells would be 132.3 million gallons. Combined with the three already-fracked wells, total water usage of the eight on the pad would be 174.5 million gallons, again a national record. We invite readers to submit examples of large wells or wellpads outside the United States — whether in the planning stage or already fracked — to see if Encana’s plan for Michigan sets a North American or even a worldwide record. The stupendous water amounts bring us to consider an aspect of the ongoing study by the University of Michigan’s Graham Institute. Lauded by Governor Rick Snyder, the study examine fracking in our state (both vertical and horizontal) and recommend policy options. The study will not conduct original research. It will not consider the baseline alternative of not fracking horizontally at all, a “no-action” alternative typically found in an environmental impact statement. Rather, the study “recognizes that natural gas extraction pressures are increasing” here, according to the website. Final policy recommendations will only be “approaches to minimize negative impacts” of fracking. The Graham Institute gave an overview of the study in an open recorded session in Lansing on March 5. Near the end, an audience member cited the 21-million gallon well, and asked whether the new information changed any of the study’s assumptions. None of the panelists — claimed to be experts in touch with industry and government — realized that under their noses Michigan had become become a guinea pig for supersize water usage. Johannes Schwank, leader of the study’s technology team, shrugged off the question. He analogized the situation to vertical wells, which he said are spaced closer and use relatively little water. Johannes Schwank, a University of Michigan member of the frack study panel, doesn't think massive water usage in Michigan frack wells is a big deal. His role in the study is to figure out how to "go after" the shale. 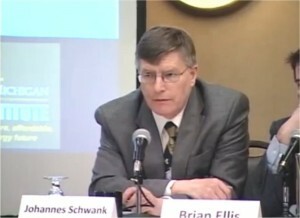 Photo from Graham Institute webinar video. In typical tight gas development reservoirs, it is common to see 20 acre vertical development to recover only 60% of the gas in place; therefore, under typical vertical spacing on this (nominal 1920) acre pooling, it would require 96 vertical wells to be drilled. With horizontal drilling it is possible to recover the same reserves (or even higher) with drilling as few as 8 horizontal wells and significantly reducing the surface impact from 96 surface pad locations to only 1. The two arguments fall apart at a moment’s reflection. First, economically, Encana would never drill multiple verticals on 20-acre units for deep shale gas; it would cost too much. Second, legally, 20-acre drilling units are not “common” or “typical.” Just the opposite. In the past DEQ sometimes permitted small units for shallow wells downstate. But today Michigan units are 40 acres, 80 acres, and sometimes combined pools of 40s and 80s. Encana knows this. The ridiculous claim, which it re-stated in several other pending applications, is not a clerical error. Spacing is a critical technical issue. A company that makes up data and tries to spoonfeed it to the MDEQ shouldn’t do business here. So the real-life alternative to a horizontal well is to leave hydrocarbons in the ground. Why would Schwank and Encana ignore the real alternative and make specious arguments? In this sense Schwank — the industry’s darling pictured in recent articles in Michigan & Oil Gas News and Crain’s Detroit Business — embraces Michigan’s overarching ideology, enshrined in statute since the 1930s, requiring the MDEQ to “foster” the oil-gas industry, and “maximize” production of hydrocarbons. An odious ideology. Hydrocarbon production needs to be curbed not maximized. Fostering the industry just guarantees Michigan will exacerbate global warming. Repeal the policy. Otherwise the Graham study will cement it in, and we will see more frack waste and more broken water records. The following article was originally published in Truthout on March 6, 2013 and is reprinted below. Several links in the story, about the frack fluid disaster on Michigan roadways and the report from the Critical Path Energy Summit link back to Ban Michigan Fracking’s website. Thank you, Truthout, for this important story. James Hansen’s eye-opening article, “Game Over for the Climate,” brought widespread attention to the Alberta Tar Sands in Canada as a source of carbon which, if tapped, would lead to irreversible global warming. There is another climate bomb in the United States, shale gas hydraulic fracking, which emits methane, more dangerous than CO2. While many rhetorically call natural gas a bridge to the clean energy future, new information is showing the opposite; natural gas will hasten climate change, poisons the air, land and water, and carries unacceptable risks to our health. We spoke with experts – Cornell engineering professor Dr. Anthony Ingraffea and biologist and author Dr. Sandra Steingraber – to explore what the newest studies show and to bust common myths about gas shale hydraulic fracking. The path out of this situation is a combination of promoting sound science, ending the extraction economy and employing direct action to weaken the stranglehold of industry on the political process. It is time to end the “all of the above” energy strategy which ensures going over the climate tipping point and instead commit to a carbon-free, nuclear-free energy economy. Extraction of oil and natural gas trapped in shale rock far below the earth’s surface is an attempt to collect the last fragments of hydrocarbons for fuels and manufacturing. As fossil fuels dwindle, the methods of acquiring them are becoming more extreme. In addition to hydrofracking, others are deepwater oil drilling, mountaintop removal, uranium mining and tar sands excavation. Industry is going to great lengths to hide the impact of these extreme methods and to promote them as safe and necessary energy sources, even falsely calling them “clean.” The American Petroleum Institute created multimedia public relations campaignswith innocuous names such as Energy Tomorrow and Energy Citizens to provide a green-washed image of the industry as one that is concerned about the environment and health and that is creating jobs and energy security. And President Obama has aided and abetted this effort with his advocacy for “all of the above” energy, while taking large donations from energy industries. Credible institutions are also used to promote the oil and gas industry’s agenda. One attempt was the Shale Resources Sustainability Institute opened at SUNY Buffalo. Fortunately, their ties to the industry were discovered and when media exposureafter their first study was released demonstrated clear bias, the program was closed by the university. The Susan G. Komen Foundation has been influenced by an industry representative, Jane Abraham, wife of Spencer Abraham, who was George W. Bush’s energy secretary and who serves on the board of Occidental Petroleum, a major fracker. In addition, Komen’s “million-dollar council” includes Koch Industries’ subsidiary, Georgia-Pacific, as well as General Electric – all fracking profiteers. Perhaps this explains why the foundation is reluctant to link chemicals such as benzene, which is released during fracking, to breast cancer, despite evidence of a connection. The industry has also infiltrated government advisory panels in order to advance their agenda. A group of scientists from 22 universities sent a letter to the Secretary of Energy, Dr. Steven Chu, because of their concern that six of the seven people appointed to his Natural Gas Subcommittee had significant ties to the oil and gas industries. With Dr. Chu’s resignation, the next Secretary of Energy is Ernest Moniz,whose work at MIT is funded by Big Oil and who is a strong proponent of natural gas. At present, the fracking industry is exempt from seven federal laws, including the Clean Water and Safe Water Acts and the Superfund Law regarding pollutants. Partnerships have even been formed between the oil and gas industry and major environmental groups to promote “safe fracking.” A Critical Path Energy Summit was held in 2011 at the Aspen Institute to promote natural gas as a “bridge fuel.” Attendees included top representatives from the Natural Resources Defense Council (NRDC), Environmental Defense Fund and Sierra Club, as well as members of the government and the oil and gas industry. The summit report states, “NGO, government and Industry leaders recognized that there is tremendous value in working together to fast track increased demand for natural gas in the power and transportation sectors through federal, EPA and state by state initiatives.” Environmental groups argue that it is important to be “at the table,” but these types of partnerships bring legitimacy to the industry under the guise of accepting some, usually inadequate, regulation. The cost of “being at the table” and taking donations from the industry is the credibility of big environmental groups. The Sierra Club learned a painful lesson after taking $26 million from Chesapeake Energy, a gas company involved in fracking, while using the rhetoric of gas as a clean fuel. Their new executive director, Michael Brune, refused a $30 million donation from the corporation because it undermined Sierra Club’s credibility. After the donation was made public, Brune wrote, “we need to leapfrog over gas whenever possible in favor of truly clean energy.” But the reality, as we see in Illinois and possibly in New York, is that by being part of the process to develop regulations for fracking, big environmental groups make it more likely that legislation will pass and fracking will move forward. And they come into conflict with local grassroots organizations who are instead fighting for a ban on fracking in their communities. In Illinois, the Hydraulic Fracking Regulation Act (HFRA) has a section on the disclosure of fracking chemicals that uses language written by Exxon and promoted by the American Legislative Exchange Council (ALEC) which has turned up in other state legislatures. The language would allow disclosure to be overseen by a front group for the oil and gas industry. The HFRA was endorsed by the local chapters of the NRDC and Sierra Club, who helped to write the industry regulations. However, regulations only work when they are enforced. The number of regulators in the Illinois Department of Natural Resources has been cut by more than half to such an insufficient level that they cannot enforce regulations adequately. Similar lack of regulation enforcement is becoming frighteningly common in other states as well. In New York, Governor Cuomo created a Hydrofracking Advisory Panel which included many of the same environmental representatives from the Aspen Summit, like the Sierra Club, and excluded the many citizen groups from New York that are opposed to fracking. This partnership has raised concerns from many of thegrassroots organizations in New York that question whether there is such a thing as safe fracking and whether natural gas is a bridge fuel. Finally, when confronted by grassroots groups and communities opposed to fracking, there is evidence that the oil and gas industry resorts to military tactics to cause division and disruption. First, it is important to point out that despite industry claims that hydraulic fracking for natural gas has been in practice since 1947, the type of fracking used now is a new entity altogether. Ingraffea refers to it as unconventional hydraulic frackingbecause it combines four types of relatively new technologies to unlock unconventional gas shale. Traditional hydraulic fracking involved one well that was drilled straight into the ground to tap a pocket of natural gas. The gas was trapped in a relatively permeable material such as sand or limestone. The new type of hydraulic fracking is trying to extract gas located in microscopic pockets and joints within relatively impermeable shale rock. In order to do this, there are two types of drills for each well: one that goes straight down for five to ten thousand feet to reach the shale, and another that drills horizontally through the shale for another five to ten thousand feet in multiple directions. Unlike traditional gas fracking, shale gas fracking requires many wells and much larger areas of land. Ingraffea states that traditional hydraulic fracking required clearing a small area of land and drilling one well. But shale gas fracking must drill into as much of the shale in the area being extracted as possible. This means bulldozing an area of 10 to 20 acres and drilling 8 to 20 wells on that pad of land. This is repeated at other locations throughout the shale area. The Marcellus Shale Basin alone is expected to contain 400,000 wells. Shale gas fracking requires substantially more energy and resources than conventional gas wells, too. In addition to the drilling rigs, each well requires a large generator to run the hydraulic pump, hundreds of truckloads of water and chemicals to provide 5 to 10 million gallons of fracking fluid, and traincar loads of sand. Each well consumes ten times the amount of water and produces ten times as much waste as a conventional well. When this is multiplied by the number of wells on a pad and the number of pads required to fully extract gas in an area, it becomes clear that the use of resources is exponentially greater in shale gas drilling – and waste continues to be produced over the multiple-year active life of the well. The waste comes in three forms: liquid, solid and gas. Water and chemicals are injected into the well and they return to the surface carrying heavy metals, organic compounds and radiation picked up from the shale. Ideally, the fracking fluid is captured and safely transported to a storage facility. Mud from the well comes to the surface carrying toxins, too, and must be contained, transported and stored. Some of this waste is placed in open pools or landfills, or is spread on the land and roadwaysin areas that permit this. Some is injected into storage wells. And some is dumpedinto waterways illegally. Gas waste in the form of leakage to the atmosphere occurs.Ongoing research suggests that 3 to 8 percent of the methane produced from each shale gas well is emitted into the atmosphere. Shale gas drilling requires large areas of heavy industrialization and huge amounts of water, chemicals and petroleum to run the pumps and transport materials and waste. Is this energy exertion reasonable based on the return? The oil and gas industry says that it is because, it claims, natural gas is a bridge fuel which burns cleaner than other hydrocarbons, like petroleum and coal, and will bring energy independence and security. According to Ingraffea, it is true that natural gas produces less carbon dioxide than other fuels when burned. What is not talked about enough is how fracking unleashes methane, which has devastating effects on climate change. Natural gas is primarily methane, and when methane is leaked into the atmosphere, it is a more potent greenhouse gas than carbon dioxide by a factor of 30 to hundreds, depending on the time period over which it is emitted and other factors. Every gas well leaks to some extent, but the current industry standard is that one out of every 20 wells leaks large amounts of methane before it is discovered to be failing. It is known that shale oil wells release over 100 million of cubic feet of gas each day as the oil is collected. This gas is burned on site rather than captured because it does not make economic sense to capture it. Only recently have studies started to ask how much methane is leaking overall from shale gas fracking, and it looks like the answer is twice as high as initially anticipated. Rather than serving as a bridge to a clean energy future, Ingraffea states, natural gas will hasten climate change, and is a climate bomb with greater potential impact than the Alberta Tar Sands. That brings the question: Is natural gas worth it because it will bring energy independence and security? The wars fought by the United States are largely over resources such as oil, and the US military is the worst polluter on the planet. So it would be a huge benefit to the planet, not to mention our domestic spending needs, if the United States reduced its military carbon footprint. It turns out that the idea of natural gas as a real source of energy independence and security is false. When shale gas fracking began, the price of natural gas was high and it seemed to be a wise investment. Most of the money for fracking comes from Wall Street investors looking for high returns. However, as the price of natural gas has fallen, these investors have started looking for better markets. They are currently pushing for laws that will allow them to export liquefied natural gas to Europe and Japan where the price is four to five times higher, and some in Oregon and Texas have been successful. Industries that use natural gas in the US are fighting its exportation because that would drive prices up. The bottom line for gas corporations is profit rather than energy independence. And just how much natural gas is available in the United States? Currently ,the United States is not producing sufficient natural gas to meet demand and imports roughly 12 percent of the gas consumed. Initial claims by the oil and gas industry were that the United States had a 100-year supply of oil and gas from fracking. Realistically, though, the number is much lower, perhaps a quarter of that based on current rates of use. And the oil and gas industry is pushing for much higher use by encouraging more natural-gas-powered vehicles and for the conversion of power plants to natural gas. It may be that all of the investment in conversion of transportation and power plants to natural gas will allow a few decades of reliance on domestic natural gas before the United States would have to pursue other sources around the world. Thus, any increase in energy independence and security would be short-lived. Energy security could be achieved by investing in a more efficient energy infrastructure and in sources of energy that do not require military conflict or extraction. These sources are wind, water and sunlight. Multiple reports have put forward plans to create a carbon-free, nuclear-free energy economy. Studies on the environmental impact and health effects of shale gas fracking are in the early phases, but answers are starting to emerge. Over 25,000 unconventional shale gas wells exist in the United States, which means that there have been ample opportunities for the industry to study and develop best practices. Ingraffea says recent research shows the current rate of significant environmental harm occurs in one out of every 150 wells drilled in Pennsylvania. There have already been scores of serious environmental incidents across the United States. Shale gas fracking is what is known as a communal industry, meaning that it takes place within communities, close to homes and schools. In fact, public schools and universities are opening their land to fracking to gain income as public funding for education falls. In a communal industry, the people in the community are subjected to industry risks. Despite that, there are no federal rules governing fracking, and regulation varies from state to state. For communal industries such as bridges and airlines, the standard risk to the population must be on the order of 1 out of tens of millions. This means that shale gas fracking, at 1 out of 150, falls in a completely unacceptable level of risk to the community, not to mention that it is common in theUnited States and other parts of the world for lower-income and minority communities to be at disproportionate risk as fracking and other dirty extraction operations are often sited near them. The types of harmful environmental events are numerous. Ingraffea points out that there are many opportunities for things to go wrong. Toxic fracking fluid routinelyspills during transport. Wells can accidentally communicate underground, leading to a blowout of fracking fluids through one well as they are pumped through another. Such a blowout occurred on Valentine’s Day this year in Colorado which sent 84,000 gallons of toxic fluids flying into the air. Fracking fluids and gas can migrate into the water table and contaminate the water supply. Methane in the water supply is believed to be the cause of spontaneous house fires. The injection of fracking waste into storage wells causes earthquakes. Open pools that store fracking waste can rupture and leak into waterways. Pipelines that carry the natural gas can rupture and leak or catch fire. Despite claims by the industry that the chemicals used in fracking are used in thefood industry and Colorado Gov. John Hickenlooper’s media stunt in which he told a Senate committee that he and industry representatives drank what they claimed was fracking fluid, the chemicals and contaminants in fracking fluid are known to cause significant harm. In response to the media stunt, Ingraffea dares industry representatives to drink what comes out of fracking wells. Every shale gas well is injected with water and at least five chemicals including known carcinogens. Over 500 chemicals are used in fracking, but the cocktail differs for each well depending on the specific circumstances. The industry has gone to great lengths to hide the identity of these chemicals as proprietary information, even going so far as to gag physicians in Pennsylvania from discussing the health effects of these chemicals with their patients. Steingraber is founder of New Yorkers Against Fracking and serves as their scientific consultant, and is also a science adviser to Americans Against Fracking. The grassroots groups opposed to fracking in New York recently succeeded in halting the forward motion of shale fracking in the state when fracking was placed on hold so that the health department could study the health impact. This practice of conducting studies of a practice before allowing its implementation, part of a scientific approach known as the precautionary principle, is consistent with what is standard in other countries. It means that chemicals should not be used in public until they are known to be safe. Normally in the United States, industries are allowed to use chemicals without determining their safety, and it is only later, if harm can be proven, that chemicals are banned. While Steingraber is pleased that the health department is conducting a study, she is concerned because the study is being conducted in private without public input. An article by Dr. Walter Tsou, past president of the American Public Health Association, describes the case of an emergency room nurse exposed for ten minutes to a driller who had fracking fluids spilled on his clothes, which caused her to develop organ failure within a few days and nearly die. A Pennsylvania report documents some of the health effects, including those from air pollution caused by shale gas drilling. It shows the proximity of shale gas wells to homes, day care centers, schools and hospitals. In March 2012, the Obama Environmental Protection Agency (EPA) shut down a Texas study that was researching the dangers of fracking to groundwater. The EPA refused to answer questions posed by Associated Press about the decision. The EPA is conducting its first scientific inquiry into the safety of fracking on water, but it will not be published until 2014. In the meantime, industry is pushing forward with mass fracking before that study is finished. The EPA doesn’t plan to address how often drinking water contamination might occur; that is, the agency won’t look into whether it occurs in 1 out of 100 or 1 out of 100,000 wells. In addition, the EPA had planned computer simulations as well as field testing water from fracking wells, but has not been able to find a drilling firm to partner with, so they may only be able to do computer simulations, a positive but inadequate step. Steingraber calls fracking the “single largest environmental threat to children’s health” because of both the toxins and the increased risk of climate change. The proximity of fracking wells to children is of great concern because children are more vulnerable to the toxic effects of chemicals than adults. Steingraber states that parents have two responsibilities to their children: to keep them safe and to plan for their future, but parents cannot keep children safe if they are surrounded by toxins in their environment and the future is uncertain if climate change accelerates. At one time, Steingraber urged parents to invest in greening their homes, but now she believes that this is equivalent to building a “beautifully appointed bomb shelter.” Instead, parents must take a greater role in shaping public policy. As she says, “Parents are not a HEPA filter” (high-efficiency particular air filter): they cannot prevent their children from being exposed to toxins in their environment. Thus, parents must prevent toxins from being allowed into the environment, and this includes greenhouse gases and toxins from fracking. Steingraber realizes that this responsibility means being engaged in the process of public policy using reliable science, but she also realizes that it may be necessary to engage in acts of nonviolent civil resistance to be effective. Steingraber believes we must draw from successful past human rights movements and create an abolition movement to put climate change on the policy table. More than 6,000 New Yorkers have already signed a pledge to commit acts of nonviolent civil resistance if their governor permits fracking. The way forward is through an immediate commitment to a carbon-free, nuclear-free energy economy. Science shows that within 20 years, we can get off of fossil fuels. The transition to a clean energy economy would have the added benefit of creating jobs. When Franklin Delano Roosevelt was governor of New York, he established some New Deal-type programs at the state level before becoming president. It is no secret that Governor Cuomo desires to run for president. This is his opportunity to lead the way and build a carbon-free, clean energy economy in New York. We ask: which side is he on, with the oil and gas industry, or with the people? You can hear our interview with Drs. Anthony Ingraffea and Sandra Steingraber on The Myths around Shale Gas Fracking on Clearing the FOG Radio (podcast) or view it on UStream/ItsOurEconomy. This article was first published on Truthout and any reprint or reproduction on any other web site must acknowledge Truthout as the original site of publication. Non-profits and educational institutions may reprint this article. All others are asked to request permission from the authors. Kevin Zeese JD and Margaret Flowers MD co-host ClearingtheFOGRadio.org on We Act Radio 1480 AM Washington, DC and on Economic Democracy Media, co-direct It’s Our Economy and are organizers of the Occupation of Washington, DC. Their twitters are @KBZeese and @MFlowers8. Michigan voters are embarking on a statewide ballot initiative in 2013 to ban fracking and frack wastes. Committee to Ban Fracking in Michigan, a ballot question committee formed last year, begins collecting signatures April 12, 2013. The committee’s new website is www.LetsBanFracking.org. Register through the website to gather signatures. Since the Committee is an all-volunteer, grassroots group with no corporate sponsorship, it seeks donations large and small from ordinary people. You don’t need to be a Michigan resident to contribute. Go here to donate to the campaign.